One prisoner did die indirectly as a result of man violence. 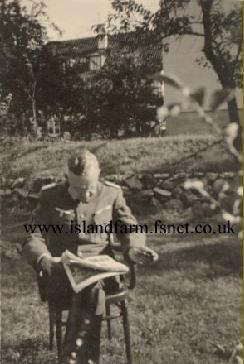 He was Otto Iskat, a 53-year old Army construction administration official who had been captured whilst supervising defensive works in France. He had made a casual remark about the futility of war and his age had not prevented the younger prisoners in his hut from falling on him in fury. Rumours speculated that he had been knifed, but these proved to be untrue. Although not an elderly man, Iskat was evidently not in good health and suffered from heart and circulatory ailments. A subsequent medical investigation revealed he died on 26 January 1945 of Acute Syncope (recurrent and sudden fainting) compounded by Arteriosclerosis and Hyperpiesia. Perhaps the trauma of the alleged attack proved more than his poor physical condition could stand. Otto Iskat finally departed Vladivostok aboard the Japanese steamer Kaikyu Maru and arrived at Trieste where he and other former prisoners of war travelled to Wien (Vienna) aboard a special reserved train. 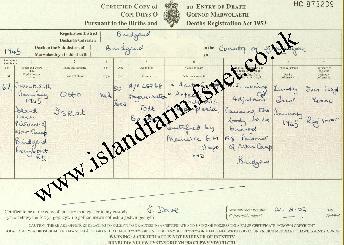 He was formally released from military service on 10 January 1921 with a 25% disability from his war service. 1 March 1921-21 December 1921: Employed by Uscininik, a company that primarily completed systems of drinking water, industrial water and water elimination. He was in charge of repair and maintenance. He was terminated on February 1922 because of poor business volume. 15 March 1922-21 December 1922: Employed as head of the construction crew of the Edelstein Machine and Toolmaker firm. 1 January 1923-August 1923: Employed by Richard Herz Machinenfabrik, a company that produced cable, jackhammers and other heavy duty shaping machinery. Correspondence shows that he was given a base salary of $27,000 kronen for the month of November 1923 demonstrating that inflation was out of hand with a 6,700% adjustment for inflation. 6 December 1923-27 April 1924: Director of Inventory for the Circus Hagenbeck. 24 May 1924-24 August 1924: Employed by the firm of Freidrich Siemens. He was in charge of a laboratory for heating technology and was especially valued for his ability to demonstrate the pricing of products including the documentation of all costs and parts. He also worked as a field technician for the firm. 25 August 1924-25 August 1926: An accountant and from 26 August 1926, he was head of the heat technology laboratory. 26 August 1926-1927: Employed as an instructor for sales personnel. Until September 1932, chief of the raw materials inventory. 1 October 1932-30 June 1936: Employed at the Alexander Herzog Ofen Fabrik in Vienna, Austria as an engineer attached to sales where he lent his expertise to selling specialty ovens. 1 October 1937-30 June 1939: Employed by the firm of Wunsch and Vogl as a technical draftsman and builder of galvanized material. Also, at some point during the years following World War I, Otto Iskat graduated from the Technical University in Wien receiving the academic title of “Ingenieur für Maschinenbau” or an Engineer responsible for building equipment. Following the Anschluss (Union) of the Republic of Austria with the Third Reich on 13 March 1938, Otto Iskat and his family found themselves citizens of Germany. Shortly after the outbreak of World War II in September 1939, Iskat was called up for military service. Leaving his civilian employment with the Heating Equipment Manufacturing Company in Stuttgart, he donned the field grey uniform of the German Army. Period photographs and anecdotal family evidence suggests he served as a Whermachtbeamte or an Armed Forces Administration Official supervising military construction projects in France. The Iskat family recalled his rank was major for most of the war, but he attained the rank of lieutenant colonel before his capture. However, the rank of major corresponded to the Whermachtbeamte rank of Regierungsbaurat, or a construction and/or building administration official, while a lieutenant colonel equated to an Oberregierungsbaurat in the same administrative field. His death certificate merely lists his rank as Baurat or construction official. While Iskat’s death certificate documents his unit affiliation as the Organisation Todt (OT), it would appear he was only on detached duty with that organization in France. Again, period photographs clearly depict Iskat wearing Army uniform and not OT dress. 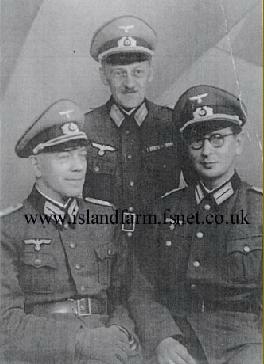 During the war, Otto Iskat was stationed in Brest, France where he supervised a large forced labour population in the construction of German military facilities. Although numerous military construction projects were launched by the Germans in Brest, it seems likely Iskat helped build the enormous U-boat shelter for the Kriegsmarine. Construction started in January 1941 on this imposing concrete shelter (333 metres in length x 192 metres in width x 17 metres in height) and, when completed, consisted of five “wet” pens each capable of docking three U-boats apiece and 15 repair pens each capable of dry docking a single U-boat. With a maximum roof thickness of 6.2 meters of concrete, the U-boat pens were protected against any bomb that Allied aircraft could drop on them at that stage of the war. In August 1944, British Lancaster bombers dropped 12,000-pound Tallboy bombs on the Brest U-boat pen. Five bombs actually penetrated the roof, but did surprisingly little damage. The 1st and 9th U-Boat Flotillas were based at Brest from June 1941-September 1944 and October 1941-September 1941 respectively. Of interest, the U-boat shelter at Brest is still used by the French Navy today. 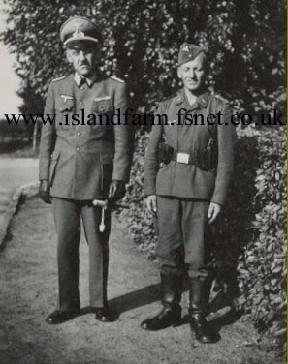 Otto Iskat (left) with a Luftwaffe private in France. Otto Iskat relaxing in France. The Iskat family also recalls that Otto might have assisted in the construction of V-1 and V-2 rocket launching sites in France. While numerous V-1 launch sites were constructed—primarily in the Pas-de-Calais area of France—only three of the massive V-2 assembly and launch sites were located in that country: Sottevast (Cherbourg peninsula), Éperlecques/Watten and Wizernes, both in the Pas-de-Calais. Although construction of these sites began in late 1943, frequent Allied air attacks combined with a delayed rocket development schedule ensured none were ever completed. All three sites were captured by Allied forces following the invasion of Normandy in June 1944. However, whether or not Otto Iskat actually had a hand in the construction of the French rocket sites cannot be substantiated with the available information. 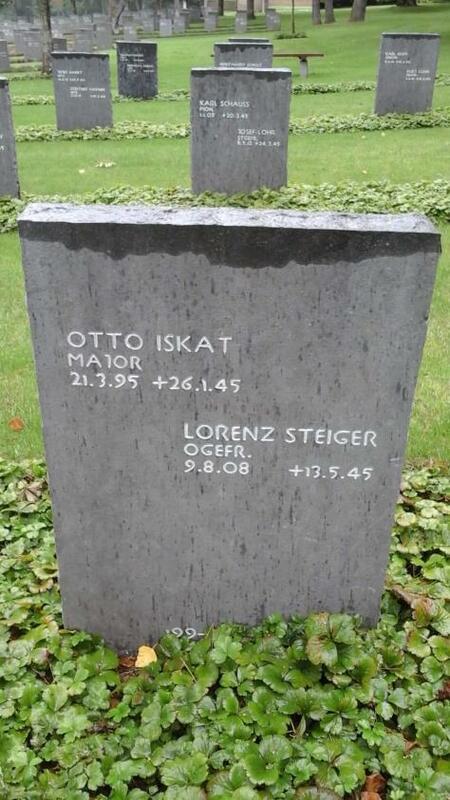 On 26 January 1945, the 53-year-old Otto Iskat died at Camp 198. 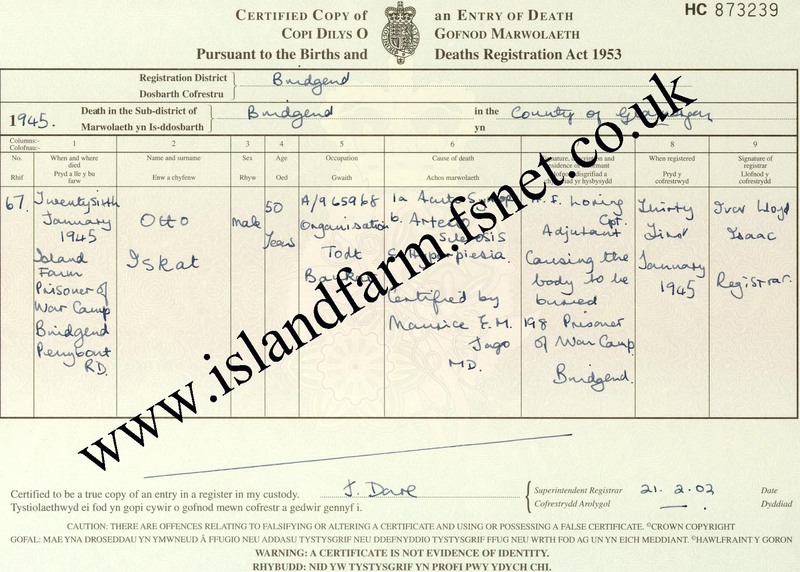 His death certificate details the cause of death as Acute Syncope (recurrent and sudden fainting) compounded by Arteriosclerosis (hardening and thickening of the walls of the arteries) and Hyperpiesia (Hypertension or high blood pressure). 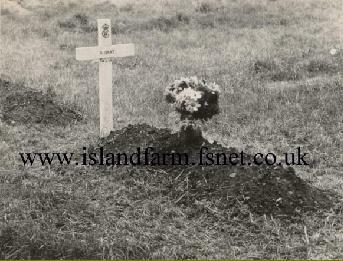 He was buried in the Bridgend Cemetery in Grave 13 of Row B and a photograph of his grave marker was eventually sent to his family in Germany. The grave of Otto Iskat in the Bridgend Cemetery (Grave 13, Row B). His remains were later transferred to Der deutsche Soldatenfriedhof (The German Military Cemetery) in Cannock Chase located north of Wolverhampton in Staffordshire, England. This cemetery was established under the terms of an agreement signed by the United Kingdom and the Federal Republic of Germany on 16 October 1959. The Volksbund Deutsche Kriegsgräberfürsorge (German War Graves Commission) designed and built the cemetery, to which the bodies of most of the German war dead buried in Great Britain and Northern Ireland were later transferred.